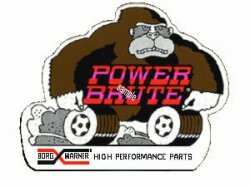 Borg Warner Power Brute - $10.00 : Bob Hoyts Classic Inspection Stickers, Add a Final Touch to your Restoration! This sticker is a for a Borg Warner Power Brute window sticker. The vintage could be in the 50's and 60's.